Another perfect winter’s day in Sydney. Dee Why fairly sparkled at 0700 when I grabbed the daily pics. But, alas, beautiful as the day promises to be, there was absolutely no hint of a wave. Nor is there any prospect in the Bureau’s predictions for an immediate improvement. MHL’s Sydney buoy was detecting 0.7 m of 12 sec from the SSE (152°), so no hint yet of the predicted long period east component the models have been showing for a few days now. As always, I’m keen to see the Goat’s thoughts on the prospects for the coming week because at least a couple of the models are showing some small hope. 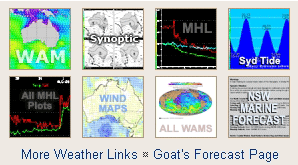 Have a great Thursday and be sure to check back this evening for the Goat’s forecast! Flatter than yesterday, or as flat? A high pressure ridge is currently across northern New South Wales, while a cold front is crossing the south of the state, maintaining gusty westerly winds over southern coastal waters. The ridge is expected to extend further south during Thursday with winds easing. Northerly winds will strengthen on Friday and Saturday ahead of the next strong cold front, expected to reach New South Wales coastal waters on Saturday night. West to southwesterly 15 to 20 knots becoming variable about 10 knots in the morning then becoming northeasterly 10 to 15 knots in the evening. Northerly 15 to 20 knots increasing to 20 to 25 knots in the early afternoon. Northerly 20 to 30 knots tending northwesterly 15 to 20 knots during the evening.